Do you know play-based preschools promote the deepest kind of learning by encouraging kids to become self-directed learners who explore, develop curiosity, and solve their own problems? Do you know what's taught at academic preschools involves the most superficial kind of learning that inhibits initiative and independence? Do you know we have decades of research in developmental psychology that shows play is the most effective way for young children to learn, develop social skills, and regulate their emotions? Do you know that play has decreased dramatically during the past 50-60 years with a corresponding increase in depression, anxiety, and suicide among children and teens? Do you know that researchers have linked a lack of play to increased narcissism and decreased empathy among young people? If you're surprised by these facts, you're probably a mom or dad who's bought into the earlier is better obsession that reigns supreme in the United States today. Anxiety is at an all-time high as parents want their children academically prepared for kindergarten. As a result, preschools have become less about play, creativity, and socialization and more about pre-reading skills, long circle times, and teacher-directed lessons. The impact on kids is devastating. Like so many in the field of early childhood education, I worry about the erosion of play in our children's lives as technology takes up more space in their heads and fills up more hours in their days. During my final five years of teaching preschool, I witnessed a new and disturbing phenomenon that troubled me then and continues to haunt me now: 4 and 5-year-old youngsters who didn't know how to engage in dramatic play! What kids once did so magnificently and naturally—using their imaginations and pretending to be firefighters, chefs, doctors, veterinarians, and superheroes—is now out of grasp for many of them. Without a doubt, this loss of creativity will have profound negative consequences for these youngsters and for society as a whole. Other countries esteem play-based preschools, seeing the long-range benefits of fostering independent and self-motivated learners. Sadly, we in the United States are extremely shortsighted, sending our youngsters to academic preschools so they'll be prepared for kindergarten. 2. Today, busy parents over-program their youngsters with structured activities (music lessons, sports teams, dance classes) and allow far too much screen time. Young children have little opportunity to play without adult interference. For many of them, preschool is the only place where they can use their imaginations while interacting with peers. 3. Sadly, kindergarten is no longer a place where play and imagination are encouraged. Many classrooms are void of toys and dramatic play areas. Children now spend time doing highly structured activities such as reading groups, math centers, and workbooks. This makes it even more crucial that preschools are creative environments where kids have a say in what activities they wish to do. 4. Many scholars in early childhood education believe a preschool teacher's most important function is to facilitate play. As children spend more time with technology, it's critical that they have opportunities at preschool to build their imaginations instead of getting spoon-fed information. 5. Recent studies show that preschool teachers can help children reach higher levels of make-believe play that bolster their imaginations, build their vocabularies, and enhance their social skills. 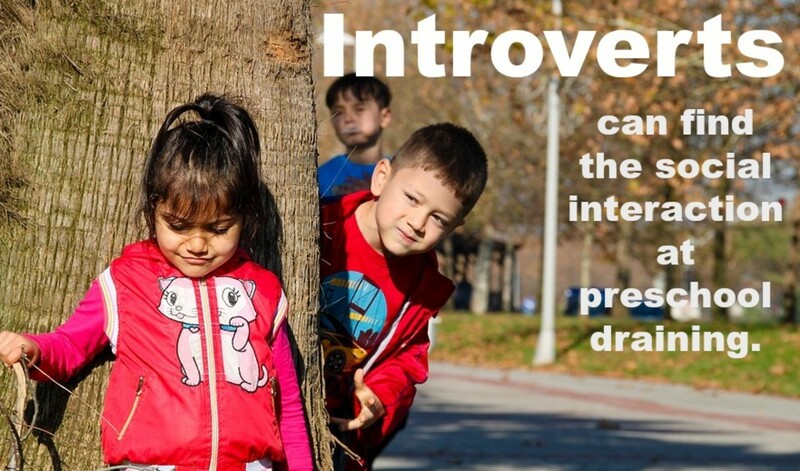 They can set up dramatic play areas in their classrooms ( a post office, hair salon, pet store, market, dentist's office, airport) to stimulate children's creative thinking and enrich their conversations. 6. It was once thought only children with special needs such as autism required help with learning how to play. 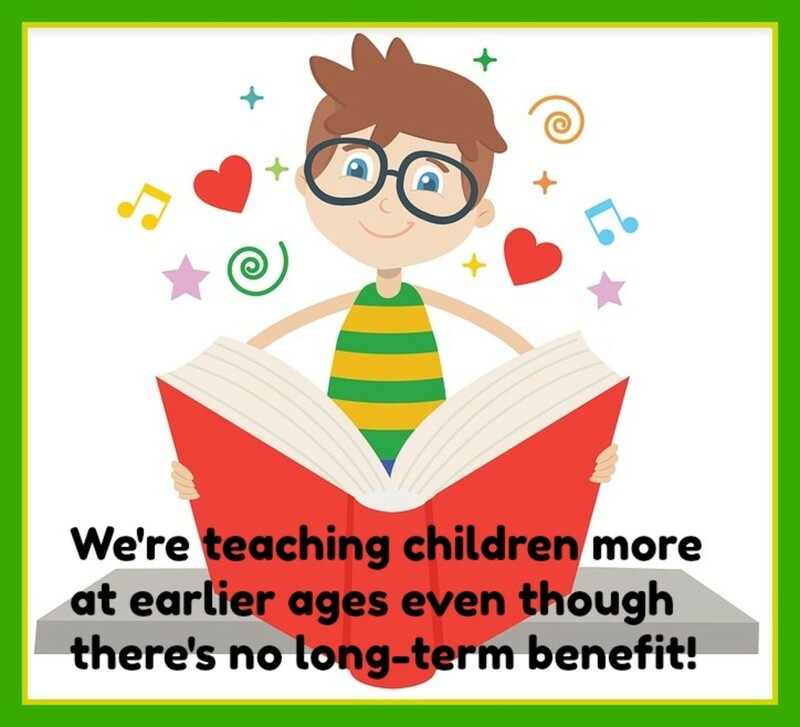 Now, though, early childhood experts believe all kids benefit from it. Good teachers help kids plan their play and extend it for days to come. 7. A skilled teacher asks questions to promote dramatic play. For example, if the children are pretending to work at a hospital, she might ask: “What role do you want—nurse, doctor, patient, or visitor? What will you use for the operating room, the waiting room, and the therapy room? How will you continue play tomorrow?" 8. Play is the most effective way to promote language skills (using proper tone of voice, eye contact, facial cues, hand gestures, body language) and build vocabulary. In the hospital scenario, children discover new words to use from one another (as well as the teacher) such as emergency, operation, surgeon, fever, stitches, and concussion. 9. A youngster with a more advanced vocabulary and more real-world experiences teaches new words to other children in a natural and fun way through play. A child whose mother is a doctor becomes the expert in the hospital scenario. A youngster whose dad works in construction gets his turn to shine when the scenario involves a building site. 10. When children are toddlers, they engage in parallel play—playing near one another but not with one another. When they're 3 and 4-year-olds at preschool, they're just beginning to interact with friends and are eager to talk. Limiting their conversations by having them sit still for long periods at circle time is counterproductive. 11. When children are playing at preschool, they develop the fine art of conversation. They learn how to take turns, negotiate, state their argument, and defend their point of view. They discover words are powerful when working with others toward a shared goal. 12. Play gives children an opportunity to develop language in a fun and meaningful way. For youngsters who aren't native speakers, it's a time to speak in their new language without feeling pressured or scrutinized. It also gives them time to speak in their first language so they don't lose their bilingualism. 13. Because they've only recently transitioned from parallel play to group play, preschoolers need lots of time to practice their social abilities such as sharing, taking turns, and listening. These are all the people skills that will come in handy during their entire lives. 14. Playing together is the best way for children to learn how to solve their own problems. An astute teacher knows how to stand back and watch, letting the kids maneuver these new social situations and intervening only when necessary. 15. According to experts in early childhood education, children need to develop empathy—the ability to see things from someone else's viewpoint—before they can truly share. This happens around age 6 says author and pediatrician, Dr. William Sears. Before that time, playing with one another—cooperating and working toward a shared goal—helps them appreciate the value of sharing and sets the foundation for empathy. 17. Employers today seek workers with emotional intelligence (EI). A person with strong EI knows how to build positive relationships, resolve conflicts, and manage her emotions. She's self-aware and empathetic. Children learn these skills during the early years of life when they're given opportunities to play with one another. 18. It's inevitable that conflicts arise when children play at preschool. If they cannot resolve the problem on their own, it gives the teacher a wonderful opportunity to intervene. She can help the kids develop the necessary social and emotional skills to handle the dispute. This is a far more important role than leading the group at circle time, reading books, or teaching about colors. 19. A child's social skills in the early years are a significant indicator of future school success. Youngsters who show antisocial behavior drop out of high school at higher rates. 20. According to child psychologists, play is the way kids make sense of the world. When they become frightened, confused, or stressed, they use play as a way to soothe themselves and come to terms with the situation. 21. Children use dramatic play at preschool to comfort themselves after a traumatic experience. A youngster who went to the doctor and got a shot may re-create that scenario again and again as she pretends she's a doctor giving shots to friends. 22. In dramatic play at preschool, children can express a wide-range of emotions (anger, sorrow, joy) that are not always acceptable in everyday life. Since they control the scenario, they feel powerful about handling these intense feelings. 23. When playing house at school, children can work through their own family stresses. A youngster whose parents are divorcing can bring that into the play, explaining to his friends that some moms and dads don't get along and need to live apart. A kid who has a new sibling may want to create a scenario where there's a crying baby who needs a diaper change. 25. Children reach a state of equilibrium when playing. This gives them the emotional and mental readiness to tackle new and challenging tasks at school. 26. Children will inevitably experience conflicts while playing and this is a good thing. It gives them the opportunity to deal with their feelings of anger and frustration. They learn how to regulate their emotions and settle their disputes so the fun can continue. 27. Today, we stress academic learning and structured activities at preschool over free play. Not coincidentally, we now see a huge increase in emotional disorders in children. This is a high price to pay for early academic achievement that's largely meaningless. 28. A recent study showed that young children who play with puzzles have better spatial skills. They're able to think about objects in three dimensions and draw conclusions about them with limited information. This is helpful when reading a map, interpreting diagrams and charts, and building structures with blocks and LEGOS. It's an important ability in math, science, and technology. 29. Playing with blocks on the rug at preschool is the ideal way for kids to learn about math in a fun and natural way. By building and talking, kids learn concepts such as shape and size, area, measurement, and geometry. 30. When children engage in dramatic play—running a grocery store, beauty salon, or restaurant—they learn about math. They discover how to use a cash register, recognize coins and bills, give change, and set prices. 31. Math at preschool is best learned through play, not teacher-directed lessons, calendar activities, or counting games. Math concepts get introduced through materials such as puzzles, blocks, Geo-boards, Unifix cubes, beads, and LEGOS. 32. Much of math education at preschool—calendar activities, counting to 100, writing numerals—is meaningless to young children and developmentally inappropriate. Youngsters learn math concepts best through dramatic play and hands-on activities. 33. Children discuss valuable math concepts in a meaningful way during play. When children pretend to cook in the kitchen area, they talk about fractions (I need half a stick of butter), measurement (Pour in 2 cups of milk), counting (Beat in four eggs), and sequencing (First, stir the batter). Every family with a preschooler should have a set of quality blocks like these at home. Blocks not only promote math skills but they stimulate conversations that make kids think about engineering and architecture: How can we make this tower bigger and stronger? How can we build this bridge wider? How can we create a city that won't collapse during an earthquake? Blocks arouse curiosity, expand vocabulary, and bring together different ideas for a common goal. Did you attend a play-based preschool as a child? If so, what was your favorite activity? My son's preschool has a learning through play approach. Is "learning through play" the same as a play-based preschool? How do we know if it’s play-based? We’re looking at a Montessori program. Would that be considered play? Waldorf? I love this article, but unsure what to do next. Could you please give me your thoughts and input about the Montessori philosophy? I am strongly considering this for my son’s preschool and elementary because they seem to teach everything through play and independence. Do you allow reprints? I would like to reprint this article in my daughter's preschool newsletter. I get paid from the clicks. Also, I love the videos there and think parents would benefit from seeing them, especially Dr. Peter Gray's TED Talk about the rise of mental illness and the decrease in play. Would it be fair to say that based on the information given here that play should be a part of the kindergarten curriculum? What can we do to make kindergarten appropriate again? Celine, good luck on your dissertation. The DEY (Defending the Early Years) website is a fabulous resource. It has regular articles and blogs from long-time leaders in early childhood education such as Dr. Nancy Carlsson-Paige and Dr. Diane Levin as well as guest writers. It has lots of information on how Common Core hurts young children. DEY also has a YouTube channel. Tania, it's a wonderful message to share and one so many adults need to hear. Thanks for sharing the message about the value of play for preschoolers and all kids, Aine. Have shared this on my preschool Page ... and I will be adding a link on our Newsletter. Excellent. I get paid for my articles based on the clicks I receive. This way they can view the 3 powerful videos in the piece as well. 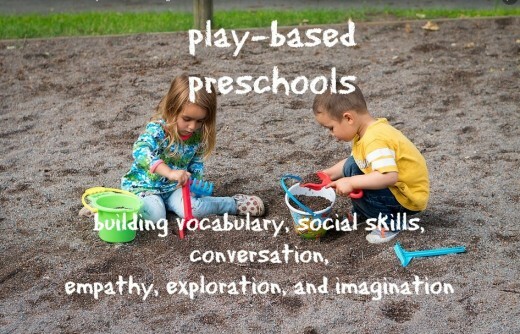 Thanks for spreading the message about the importance of play-based preschools! I too would like to print in my preschool news letter... Pls guide if I can and how to get the text. Yes, that sums it up, Kathryn. I don't know why politicians, administrators, and bureaucrats decided to focus on early childhood education and demand academic rigor there when we have so much research to prove it folly. I volunteered at my son's middle school for three years, and that's certainly a place where academic rigor is appropriate and sorely lacking. Students, such as my son, want more challenging classes with classmates who are motivated to learn but are told there are no options. Some parents have their children do classes online in math and science and then take them to middle school for orchestra, art, and P.E. High schools can definitely benefit from more vocational training classes but, oh no, we have to focus on preschool and kindergarten and take away play and creativity from 4 and 5-year-olds. Ugh! "Not coincidentally, we now see a huge increase in emotional disorders in children. This is a high price to pay for early academic achievement that's largely meaningless." Thanks. While other countries value play at preschool, the U.S. is moving away from it. We're also seeing an increase in anxiety among our children and teens. It's definitely not a coincidence. Children need play for their mental, physical, and psychological well-being. What does this say about us as a nation that we so want to severely limit children's play in preschool and kindergarten? Nothing good. Guiding, Thought provoking and Great Article .